If you still have no idea what I’m talking about, here we go… As we know planets are always spinning (and if you didn’t than there is a fun team room fact you can share) Retrograde is when a planet “appears” to stop spinning and move backwards. Don’t worry all planets do this, but when Mercury goes retrograde (up to four times a year for about three weeks at a time) us awesome earthlings feel the full, crappy force of it. Even people whom “don’t believe in astrology” or all that other mumbo jumbo, new age hippie business often believe in the crazy aftershocks of Mercury retrograde. Why is that you may ask? It’s because Mercury, is said to be the planet that influences communication, logical thinking and travel. So when the planet goes retrograde (backwards in the sky) all things influenced by Mercury go backwards. Don’t make any important moves when Mercury is retrograde. Nothing will be settled successfully for the future during these periods,so is not a good time to sign any new contracts or even to shake hands on any new agreements. Do not sign a new lease or close on a house during this time. Anyway you will find it nearly impossible to nail down a plan. It’s also highly unreliable to complete important transactions, access accurate information or make big decisions. When Mercury retrogrades it is notorious for information and communication being scrabbled. Which causes confusion so don’t forget to clarify information and get feedback when communication with others. Miscommunication is rife during retrograde, so make sure you’re expressing your thoughts, ideas and opinions as clearly as possible. You’ll have to work harder to get your point across. I advise you that it would not be a good times to do anything involving communications, such as launch a magazine, website (which I just realised I did duh!). Also it is also considered poor time to launch any new endeavours, even if they are not related to the communications industries. And don’t forget verbal agreements are considered the same as written ones. So how can we use Mercury retrograde energy during this time? Mercury retrograde encourages us ( sometimes as painful and annoyed as ripping a bandaid off an old wound you thought had healed) or in some cases to tie up loose ends, as we all know bitterness looks ugly on people especially if you are holding onto a grudge towards someone else. Bitterness, negative emotions and bad vibes as well all know is like drinking Poison and waiting for the other person to die… USELESS and honestly it’s make you age terribly so my advise.. It’s time to move on remembering you don’t have to forget but forgive, not for them but for your own peace. It’s always fun giving your home a makeover, and if you have been thinking about redecorating for a while now is the time, tap into the Mercury retrograde energy and go for it. Your home is a reflection of your fabulous self and there is no better feeling than being proud of your home, it’s an instant confidence boost but remember no BIG PURCHASES during Mercury retrograde so plan plan plan, Rearrange your place , spring clean, jump online and get lost on Pinterest planing and getting creative ideas for your dream home. Toss out the old stuff and donate it to charity ( good karma) or sell it online and make extra cash for when you can start buying up big! 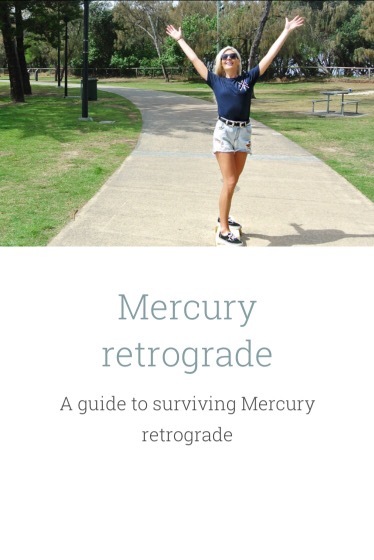 Mercury retrograde is the best time to step into a time warp, play that old CD from high school, watch movies you loved as a kid , flick through old photos remember all the times, feel like a kid again when everything was magical! So sit tight guys, Mercury retrograde luckily only last a few weeks, so use this time to do anything that involves “Re” revise old plans and projects, rearrange , redecorate and revisit any personal issues and feelings that happen to come up during this time , it’s an indication it hasn’t been fully healed. And remember this is not a time to start anything new or sign new contracts. Mercury the messenger is having a mini melt down so expect mixed messages, communication brake downs, technology malfunctions and travel hiccups. Reblogged this on Journey by the sea.